A punch or circle cutter is useful for making the holes for the handle of the bag. However, if you don't have a circle cutter you can cut the holes by hand using scissors. The best way to do this is to make a small hole in the center first and use this as a starting point for cutting. When it comes to what to use to decorate your bag it all boils down to how crafty you feel like being. Anything you would use to decorate paper you can use on your bag. One fun idea is to use feathers to trim the opening of the bag. 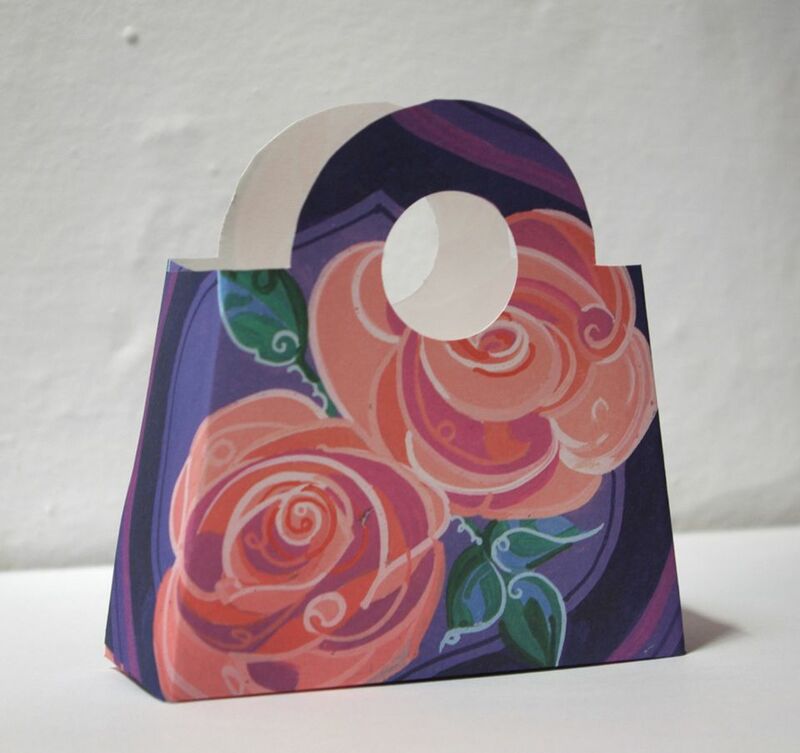 Print the handbag gift bag template onto scrap paper and transfer this to a piece of cardstock. You can size the template to your desired size. Smaller sized ones are usually better for table decorations but larger ones can be used to hold favors. Choose the size based on what your plans for the final product are. Cut around the template and score along the fold lines, this will give a good crisp edge to work with. Now it's time to stamp and decorate your bags in any way you want. It is easier to do this step before assembling the bag. If you don't want to decorate your bags you can always use colored paper to give some life. You can decorate the handbags to look like your friend's favorite purses! Adhere the side edges together using glue or double sided tape. If you don't intend the purses to hold party favors then you can glue the top edge together as well. After the sides are glued together you can add more decoration if you like. Some people like to make straps for their purses using ribbon. What will your imagination come up with? For a wide selection of other gift packaging templates and projects, including both gift bags and gift boxes that are perfect for customizing to any occasion see gift packaging projects. Here is a selection of free printable templates for you to enjoy! Don't forget, you can add digital stamps to templates and this is a quick way add decoration to the finished item.